STruggling with Quickbooks for your amazon business? 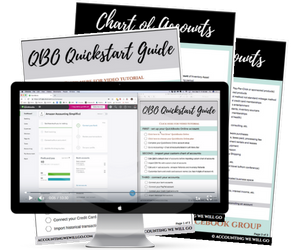 “QBO Quickstart Guide” including video tutorial and Chart of Accounts! are you tired of not knowing how to set up your accounting system? If you're stuck trying to set up an accounting system for your Amazon business, or you've tried different spreadsheets and softwares but haven't been able to stick with it, we understand! If you're overwhelmed with accounting software options that never have a roadmap to get started, you're not alone. stop wasting time and get started! You now have useful financial feedback and less time wasted weeding through countless blog posts and YouTube videos trying to figure out how to set up your accounting system. THAT’S WHY WE CREATE OUR “QBO QUICKSTART GUIDE” WITH VIDEO TUTORIAL AND CHART OF ACCOUNTS TO HELP YOU START BUILDING AN ACCOUNTING SYSTEM THAT WILL LAST! I am the founder of the FREE Facebook group, Accounting We Will Go, which currently has over 9,000 members. I have over 20 years experience as a CPA and am passionate about using my knowledge to help online sellers get their books in order. I am a QuickBooks Online Certified ProAdvisor and organizer extraordinaire. I enjoy helping online sellers create an accounting system to streamline their bookkeeping process and experience the relief of knowing their numbers on a regular basis. STILL HAVE QUESTIONS! Send us an email at hello@accountingwewillgo.com. WE’RE HAPPY TO HELP!